Busting out the science behind liquid cooling! Welcome to my round 11 fan testing. This is a fairly small round of fans from the kits I previously tested. Rather than do my normal written form, I’m trying to do this more video based. This video does some physical comparisons of the fans and gives you a good close up look of the fan, sleeving, build quality, etc compared with my previous best performing fan the Gentle Typhoon. This video is just a quick overview of the flow bench and meters used in the fan testing to follow. The following videos are of the actual test run on each fan recorded with audio and stepping through 50FPM air flow results. You can now easily adjust two or more fan videos to like air flow numbers and pause them both, then switch back and fort for a direct apples to apples air flow comparison. These were pulled from the video, by isolating a looped region where air flow was close to the 50FPM increment. This provides the resulting detail read on the meters and a calculated RPM. On the right are some subjective noise quality comments I added as I reviewed and extracted the results. This is the “Meat & Potatoes” result. While I wish I could measure noise quality in a good quantitative way, that’s really not possible. The next best thing is to compare noise levels when mounted to a radiator at like air flows through that radiator. It takes into account the fans pressure capabilities and puts it in a more real world condition. It’s not perfect, but the best thing I’ve been able to come up with to simplify radiator noise performance. Fans that extend further right are capable of higher air flow maximum results at 12V. Fans with lines lower on the Y axis are producing more air flow per noise level. No real surprise, but the kit fans all tested relatively the same (most within 3dbA or less differences which fall within the “barely perceptible” level). The Helix fan did for some reason have a bit higher than expected harmonics on the radiator bench which didn’t seem to be as noticeable when actually testing in a case, but it is something I heard a little when trying push only. In push+pull I noticed most of that helix harmonic disappeared. I would consider the kit results to be relatively similar, they are like most fans and all perform roughly the same. The Gentle Typhoon however does seem to retain that unique ability on a radiator and tested upwards to 8-9dBA lower in noise level at 12V than other fans producing the same flow. The H100i fans and their 2700RPM capability did produce the highest maximum air flow, but it comes at the prices of having a fairly gritty noise quality. Noise quality isn’t captured well in the graph and really only something you can listen for in the videos. The other aspect I’m now noticing that is missing from this single fan test bench is harmonics between the two same fans. In the thermal testing using the kits and earlier noise testing, I had significant RPM harmonics issues with the H100i fans, but a single fans test scenario completely misses that. This is something I seriously want to consider in fan flow bench future upgrades. I think it is important to capture the “paired fan” harmonics effects as it can be fairly significant. The helix H220 fans did really well paired together in the kit testing, but you just can’t see that in a single fan test. Also as noted some of the pressure harmonics issues can also be mitigated for by going push + pull. The helix fans don’t show real well in this single push test, but I found when testing four fans in push/pull on a radiator the fans worked very well together. They are not up to Gentle Typhoon silence or build quality standards, but in use I would say they fair better than what the above chart or single fan test result demonstrates. This at least gives you one more perspective on the sound. I would suggest listening to the fans at like air flow levels and make a decision not based on noise level, but what you perceive as being less irritating. That is likely a combination of frequency, noise quality, and noise level. Don’t put too much weight on the noise level, it is important, but it’s not the entire picture and each person and each setup will be slightly different. In the continued pursuit of the ultimate radiator fan, I bring you round #10. This round was brought to you buy “cpachris” from overclock.net. He sponsored 5 never tested before fans including the new Bitfenix Spectra Pro Black, Noctua NF-F12 PWM, Silenx Effizio, Noise Blocker M12-S2, and Phobya Naon-G12. I put these up to the test against the previous undefeated Gentle Typhoon AP-15. While many fans are good in case fan applications, few seem to rival the low noise output of the GTs once mounted to a radiator. Unfortunately the GTs are not perfect either, they are a rather boring grey/black color scheme, they do have some resonance issues at specific RPMs, and they are often out of stock and suspect to overpricing due to their high demand and inadequate production. With that, let’s bring it! For the test rig, I’ve built an exhaust collection chamber that’s basically a long piece of 8″ PVC with insulation, a bunch of flow spreader tubes, and an MCR120 radiator mounted to the face of it. The anemometer hot wire sensor is then mounted to the back of this to measure air speed through a smaller port. The chamber’s purpose is to collect the fan exhaust, straighten it out, and provide a consistent means to measure it in a fixed spot without creating additional noise. The video is via Canon T2i and audio via Zoom H1. Not shown in the photo, but I place the Zoom on a tripod in line with the fan at a 12″ distance and the zoom has a foam wind protection sock on it. The lens used this round was the kit 18-55 as opposed to the Tokina shown below, but you get the idea good HD video and good HD stereo audio are at the heart of the tools. I combine the video and audio in Sony Vegas 9, add the text notes, and export to an 8MB/sec wmv before uploading to youtube. During this combining effort, I set the T2i audio to mute and turn on the Zoom H1 audio. I use a double finger snap to create a wavform mark so I can line the two up. Then I trim the whole thing to start/end of the test done. Here is a summary of what the video meters produced. Sorry about the lack of RPM data on the Silenx, but something was odd with the Hz readings, so I pulled the data off. The Gentle Typhoon AP-15 results are still the strongest of the bunch in terms of CFM per dBA, however I would as usual encourage you to evaluate the noise characteristics in addition to noise level for a more complete picture. I have received messages by some readers indicating that they can’t stand the noise type of the GTs and I would agree that they do produce a different type of noise that may or may not be what you are willing to put up with. The GT’s also do have a habit of resonating as specific RPMs as can be seen by the bump in the noise chart below. The GTs just have a special fan blade that seems to bury nearly all air type noises into the radiator which is good, but it also tends to have a little bit of bearing whine and the motor noise is present perhaps a bit more than other fans. I think the noise quality of some of the other fans is superior, but the GT-15 remains dominant in noise level. The noiseblocker actually has good noise ber RPM, but isn’t pushing as much air per RPM. The Noctua has a very good CFM/RPM similar to the GT15 leaving some of the others as much as 200RPM behind. Regarding looks, I liked the noiseblocker, Phobya, and Bitfenix better than either the Noctua or GT. As far as build quality goes, the GT probably gets my vote as it has a larger hub with metal bearing casing and dual ball bearing construction. The Noctua probably provides the most accessories giving you several resistor options to reduce fan speeds if you didn’t have a fan controller. Finally, there is PWM control which is only provided by the Noctua in this bunch. You could however control the others via software tools like a Sunbeam Rheosmart without much extra cost. So there you have it, another round of 120mm fans and the GT-15 is still king of noise level, however there are other factors to consider that may sway you toward other options. A special thanks goes out to “cpachris” from OCN for sponsoring these fans and my many supporters for sponsoring the tools, equipment, and website. As part of my radiator testing, I did purchase several sets of fans to experiment with. Since the Gentle Typhoon AP-15 did so well in a noise/cfm ratio in previous testing I had been curious how the higher speed GTs work in comparison. The AP-29 differs from the AP-15 in that it only has 7 blades as opposed to 9 and it also has a special and unique stiffening ring. I tried to make contact with Scythe about possibly sponsoring fans but my request was ignored and I could never make any sort of actual contact. The Titans are just something I found perusing SVC one day and had to have a set and also picked them for my radiator testing since they were cheap, in stock, and had a good RPM range. Being without any sponsor, I’ll give myself a special thanks to MLL.org for sponsoring this test…:) I ordered the GT AP-29s from an ebay seller as it seemed to be the cheapest price shipped I could find. I also ordered the Titan’s from SVC myself since they were on sale for $10.99 and I was anxiously crossing my fingers I would find a good alternative to the GTs. First thing to catch my attention is this fan comes only with 4 pin molex connectors, so you will need an adapter or to rewire it on your own if you need 3 pin. The fan doesn’t come with much more than standard self tapping case screws. It is built well though and heavy and more industrial in quality than your average 25mm fan. For comparison purposes with the previous 1000-1800RPM winner, here is the AP15. The king of CFM/RPM from my previous rounds. For comparison with a good but average noise level and more conventional 7 bladed fan, here is the Zalman ZM-F3. It what I consider a good average noise level fan at a great price. It also has a pretty good speed range so it’s a good one to compare with as well. These are the fans I’m using for the radiator testing that were attempting to be low cost GTs. They look nice and actually do better than the Zalman at slower speeds, but things fall apart quickly at the higher speed range. The sample tested seemed to have some debris in the motor causing a bit of rubbing type noises from 1400-1800 and then a harmonic developed from 1800 up to 2300RPM. The debris would probably work itself over time and the harmonic may or may not be specific to the radiator test rig, but that’s what I got in this run. The charts above include looking at a few variables independently. Of primary value is the air flow vs noise level chart which is the most representative of radiator performance. It’s not perfect nor as good as actual thermal based testing, but I find it good “quick” simulation that allows looking at the full spectrum of possible undervolting conditions very quickly. It does however only represent noise “Level” and not “Quality”. Chart 2 is just comparing RPM to noise and plots a similar response. The GTs are very good about keeping noise “Level” down to a minimum when mounted to a radiator and much the same using RPM between the 15 and 29. Chart 3 is taking a closer look at how much air they push per RPM. This is where the GT 15s doing very well having a higher blade count without stiffening ring allows them to produce more air per RPM. General most fans produce the same amount withing about a 200-400RPM window though. Somewhat surprising though, the Titan despite it’s similar appearance doesn’t have the same flow/rpm advantage as the GT 15s. There is quite a bit more gap between fan blade and frame and slightly different blade pitch as well as how the back of the blade curves more than the GTs. The AP-29s do a bit better than average at slower speeds, but seem to loose all of that advantage from about 2000RPM on upwards which I suspect is mostly due to the stiffening ring causing turbulence. The higher speed AP-29 does seem to follow in a similar trend (CFM per RPM) as the exceptionally low AP-15 did although I would say subjectively when listening to the videos side by side, the 15 is producing less motor noise and smoother in sound. The stiffening ring does seem to eliminate the resonance spikes that are present as specific RPM levels of the AP-15, so that’s a good thing although the CFM per RPM level is not quite as good as the 15 which is also probably due to this same ring. The range is a bit more limited on the lower end were 5V is basically starting at 1200RPM, but it makes up for that in it’s near 3000RPM maximum at 12V. While it’s hard to find fault in the AP-29, I personally find noise levels beyond 2000RPM still to high for my taste despite the noise levels being significantly lower than your average fan and also find the noise quality of the GT15 better than the 29 at slower speeds so it is a bit of a compromise. I think more people would be better off with the slower speed 15, but the AP-29 does extend the fan power range for those needing similar GT quality in a higher speed flavor. As with pretty much all fans, you can’t have it all and extremely high speed fans generally struggle at slower speeds and the AP family is much the same there. The AP-29s are exceptionally good at 1800-3000RPM, but the AP-15s are still king of 1000-1800RPM levels. The Titan Kukri’s do pretty well at slower speeds and they do have a more desirable white blade color, but they are not even in the same league regarding build quality as the gentle typhoons. On my particular test rig with radiator, I also had high speed harmonics and other not so smooth motor type noises as RPMs increase beyond about 1400RPM and particularly beyond 1800RPM. Not quite sure why but I suspect it’s the blades flexing since the plastic used is softer than that of the GTs and not as reinforced at the hub either. Overall a great fan for the price when operated at slower speeds, but the Titans are not at all outperforming or coming close in performance to the GT-15 in terms of noise level or noise quality in the 1400-1800 range. I would say they are better than average in the <1300-1400RPM level, but average to poor at higher speeds. Welcome to my review of the Aquaero 5 XT controller. While there are many manual fan controllers out there and some software controlled options, few take the features and control as far as the Aquaero 5. This is not the first iteration of the aquaero, it’s been many years in development through previous generations, so quite a history(since 2004) behind it. While I have done some testing on the aquastream XT here, this is my first look at a controller as advanced as the aquaero XT 5 and it is without a doubt the most feature rich and most highly configurable controller out there. Calling it a fan controller really doesn’t do the product justice as it is so much more and really acts as a mini computer to monitor and control your entire computer cooling system. Before getting started, I’d like to thank Shoggy from Aqua-comuter.de for supplying this review sample. Thanks! The product I’m reviewing is the top model aquaero XT with IR remote as you see above but there are several model options and many accessories to chose from that I’ll go into later. Aqua-computers called it the “Aquaero” because it serves to integrate controls for and between water and air and I think that pretty fitting.While it does control fans, it also does much more to act as the brains and control behind both a normal PC and also HTPC with all the IR connection features and ability to control other IR devices through the Aquaero 5. I basically gives you the ability to monitor, adjust, and dynamically control pretty much anything air, water, and light related. Since I’m a visual person, I created this simplified diagram to show the various communications that may occur depending on the setup. A big part of my intent of this guide/review is to emphasize on the “Guide” portion by learning how to use the controller and sharing what I’ve learned. Fan channels could also be used to feed pumps withing current limits. 2x 2 pin PWM – 12V, 1A modulated at 15 kHz. May be used for lighting. 1X RGB-LED 4 pin output – up to three single color LEDs or one RGB module. 20mA, 3-4V. Resistor built in AQ5. 1X “Tacho” signal generator for Alarm functions to motherboard. So, without a doubt the AQ5 is busting out the seams in features and really has no equivalent or competition boasting this sort of feature set. While I’ve already hit on a few notes about the model versions in the features list, next I’ll give you a bit more detail about the model versions available and expansion options. Controlling fans manually has been available via standard fan controllers for some time, you turn a knob up or down and it adjusts the voltage to the fan and resulting speed/noise. There are many flavors of this all manual control type, but what if you wanted to automate this process similar to current motherboard 4 pin CPU fans such that speeds remain low(low noise) while loads are light, but they are increased when the loads increase(high noise)? There are several options to do this, but most options typically consist of a very advanced AND expensive fan controllers. I personally have used a few manual fan controllers. My first was one from Thermaltake, unfortunately it didn’t take long for that fan controller to burn out. Then I bought a sunbeam rheobus controller with four channels similar to this. I used that fan controller for over two years and to this day it still works fine although my loads were always kept fairly light. It was cheap, but it seemed to hold up and the only obvious difference was the heatsinks that it had. Soo…..when I heard Sunbeam was coming out with the Rheosmart to convert PWM into analog voltage, I was instantly very interested. When they hit the shelves at Newegg, I added it to another hardware order I had planned…after all it was only $25 shipped. It sat in the box for a while and eventually I got around to using it and ultimately doing some testing and this review. In general the controller looks pretty good from the front. I do like the mesh finish for some cases and the LED lights are not overly bright like my old model. The turning knobs however feel cheap because the socket pot flexes quite a bit, but in normal operation it should work well enough. The PCB parts and heat sinks look ok, although the sinks were not very evenly glued in place. For the low cost the looks and quality is ok.
Operation is fairly simple. There is a button below each knob and an LED above each knob. When the button is pushed in the LED turns red which means it will operate under PWM. When it is out, the LED turns green which means the knob and manual voltage controls. Manual control range is good, giving you the ability to control from 0V to the maximum which I found to be around 11.2-11.4V due to losses in the controller while supplying it 12.1V+-. The controller comes with a very good manual that should help you right through the process, but I’ll attempt to at least give you an idea how things work. There are 5 ports on the controller. Two input and three output. The 4 pin PWM fan connector is actually serving several functions. One is a pass-through to a pump or CPU fan, in my case I used a pump. The second function is that it sends the PWM signal and ground to the fan controller. The three out connections are simply power and ground outputs to the fans. If you use the RPM splitter cable provided (you only get one of these), you can also send the fan RPM signal to the motherboard. So, the controller takes the PWM signal generated by the motherboard and converts it to analog voltage which any normal 3 pin fan can use to speed up and slow down. In my long term test I used the PWM pass through to also regulate the speed of my Swiftech MCP-35X which has it’s own PWM speed controller. This way PWM is increasing and decreasing speeds of my fans using the controller as well as my pump using it’s controller. I have been using the unit to control four yate loon fans on my CPU loop for a couple of weeks now using PWM control with very good success, so I had high expectations the testing would go very well for the light load fans test. In my own long term test I have been running the fans in between about 30% to 70% which means the fans have been running between 6.5V and up to 10V. Note that maximum voltage with this lighter load is 11.43V, and my power supply is providing roughly 12.1V. Losses within the fan controller are responsible for this voltage loss and it is fairly typical for normal fan controllers to do this unless they have a transformer to boost voltage. No good, the pump was too much at 65% or lower. Unfortunately the test didn’t go well, the pump would repeatedly quit when the PWM percentage was turned to 65%. Max voltage at 100% PWM was 11.21V. Min voltage at 70% PWM was 10.02V, so the range was only 1.2V. I’m assuming there just wasn’t enough current to keep the pump running or some sort of voltage instability that caused the pump to shut down. I’m not entirely sure, but it wasn’t something I wanted to try long term considering the range was so small. With the lighter fans load the aluminum heat sinks kept the temperature at a reasonable lower 40s or about 16-18C higher than ambient. The pump test however produced fairly high temperatures particularly the 8V scenario which was reaching into the mid 60s. Perhaps that’s still within specification, but I personally wouldn’t feel comfortable running one this hot especially if you had a valuable hard drive directly above and little air flow. I am very happy with the controller for my own purpose of controlling around 4 watts per channel worth of fans. It has given me dynamic loading PWM capabilities to those fans that I would otherwise not have. My fans now throttle via CPU temperature such that 99% of the time they are a whispery 900RPM, and when I load hard such as rendering a video, playing games, or benching..they turn up to 1300RPM. I have the controller doing my fans, and the Swiftech MCP-35X using it’s own PWM controller, both are using speedfan to regulate. Between the fans and pump reductions, PWM dynamic loading has cut my ambient noise level from 42dbA to about 35dbA which is fairly dramatic…and I’m happy. The controller also does allow the user to switch between PWM and manual controls via a push button, so you do have some flexibility there to use a few channels manual and others PWM. In addition the PWM connector includes a daisy chain connector so I can utilize the PWM of my pump. The pump isn’t capable of running through the controller, but the PWM signal is split to the two components with success. I would not however recommend this controller for use on pumps or really high fan loads if the intent is to control them via PWM. My heavy load (approx. 20 watt) test scenario failed to keep the pump operating when PWM was lowered to 65% or lower. Heat sink temperatures also reached 64C when run passively in an open air test which is getting really hot for my own preferences. Having the controller buried in a case front where little airflow may be available, could lead to even higher temperatures. 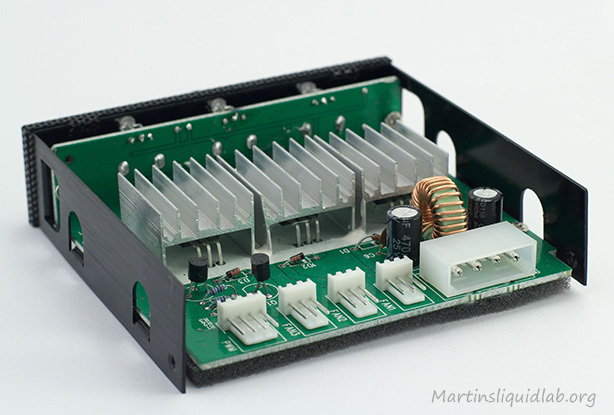 Overall, a great and low cost product to give you PWM like fan control of lighter loads. I would recommend it for 5W per channel for full control. You could probably do more, but I was only successful in my light 4W test load in making use of the full PWM conversion feature and heat was also fairly comfortable at that lighter level.